The transformer is plugged into the nearest power source. From here the electrical cord is run to the LED infra-red sensor which is positioned in an unobtrusive spot near the cistern. The electrical cord is then threaded along the inside of the PVC exhaust pipe to the 12V DC Motor which is installed inside the cistern. The Motor is positioned safely above the water line and out of the way of the ball valve. If this is not possible, an alternative float mechanism can be installed. 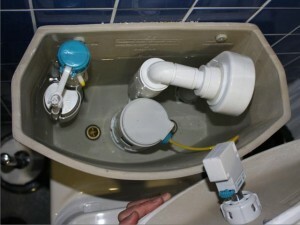 The cistern lid is sealed with petroleum jelly [vaseline] to create a partial vacuum above the water line. Demonstration installation in our showroom. 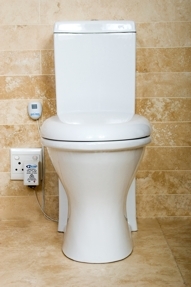 When the Toilet Odour Removal System is activated, the 12V DC Motor drives the Extractor Fan causing air to be drawn from the toilet bowl via the flush-water ducts and overflow snorkel into the cistern. From here the air is expelled, either via the waste water pipe into the sewerage system or through the wall into the atmosphere, depending on the client’s preference. The Toilet Odour Removal System can be fitted to any existing toilet or urinal in about one hour and will last up 100 000 hours – depending on operating circumstances! It completely does away with the need for CFC-propelled air fresheners and odour-masking sprays, making it an environmentally-friendly solution to an age old problem.